Our dark purple CV template contains many different elements to help your CV to stand out from the rest. It uses the Headline One font designed by Andrew Leman (download link below). It can be fully customised in Microsoft Word which means that you can change any of the headings if you want to, as well as the placeholder text. This is a great template that is perfect for web designers and other professions where creativity plays a huge part. Purple creative CV template with a 'persona' background image and 'barcode' header	Overall rating:	3.8	out of 5 based on 5	reviews. When applying for a creative role, you need to make an impression with your application. This brilliant free CV template uses dark purple and plenty of graphical elements to create an overall look that is stylish but easy to follow. The length of your CV is one of the many important factors to consider when writing a CV. With literally hundreds being sent to an employer for just one job, it’s critical that yours stands out from the rest by keeping it short, relevant and to the point. To help you decide on what to keep and how long to make your CV, here’s a few of our great tips to steer you in the right direction. The amount of pages you use for your CV really depends on a lot of factors. For instance, if you’re applying for a medical position the standard amount of pages may be three or more. This is because of the amount of detail that’s required for medical qualifications – background, experience and skills. However, most employers expect just two pages for a CV – and here’s why. You’ll often find that three pages or more is too long and won’t keep the readers attention. With so many CV’s being received via e-mail and post, the hiring manager has to make some very quick decisions to narrow the search down, and one of those factors is the amount of pages. Two pages is the perfect length to allow the hiring manager to see everything they need quickly and efficiently. Although your CV may be read in much more detail at a later time (if chosen), the initial read will be very quick to help narrow the search down. A one page CV is clearly missing the point altogether, and will leave many an employer scratching their head looking for the missing second page. A one page CV will not allow you enough room to cover all the usual sections, and if you make the font too small as well as the margins, you’d probably need a magnifying glass to read it. Overall, the one page CV will just end up looking like a bunched up mess of information and will stand no chance against other applications. The two page CV is the perfect size to allow all of the relevant information to be present, and ensures there isn’t too much information to put the reader off. 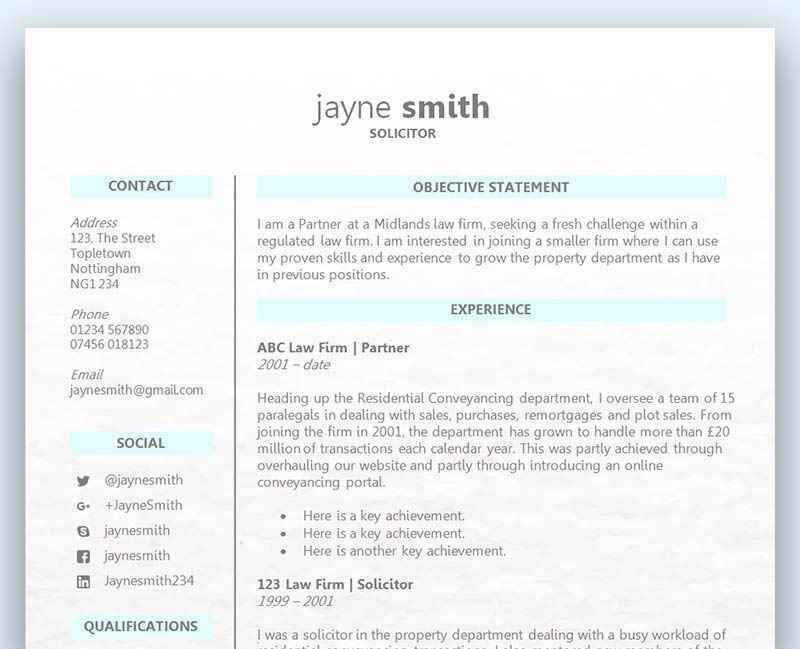 If spaced correctly using the right professional font and margins, the two page CV will be just right. A generic CV that doesn’t actually target what the employer wants is not worth the paper it’s written on. The modern CV has to be custom written to fit the job description and ensure the reader instantly spots the skills, qualifications and experience advertised throughout the job posting. Look for the obvious keywords on the advert, and consider using them in your CV. This is a great way to get noticed, as you are making it really easy for the employer to see that you are the right person for the job. It will also ensure that if the employer is using an ATS (Applicant Tracking System) that your CV will get through to the next stage. More advanced software is being developed constantly to help larger organisations to filter out the right candidates from the hundreds of CVs they receive. Not only will the relevant keywords help you to get through that filtering system, it will also ensure both you and the hiring manager are on the same page. Don’t forget that you are trying to keep the readers attention throughout, so waffling on about how great you were in your last job is not going to make a positive impact. It’s important to remember that your CV will get read very quickly on its first viewing, and the reader will be looking for keywords, skills and qualifications that match what they are looking for. Keep each sentence and point short and concise, making sure it tells the reader exactly what you want them to know with as fewer words as possible. Bullet points are great for listing tasks and responsibilities for your work history, as well as skills and qualifications. Once you have written your first draft, check back over your CV to see if everything you’ve written creates value to your application. A common mistake is to put down everything you’ve achieved to try and impress the employer. That will be unlikely to pay off, but what will impress them is if you can demonstrate how perfect you are for the role. You can only do this if you provide relevant information and only focus upon what will matter to them – not you. Highlighting relevant information is going to get you noticed, and there will often be times when you’re writing about something that you know isn’t going to make any kind of impact on your prospects of gaining an interview. It doesn’t always mean that you should completely leave it out, especially if it would mean leaving a gap in your employment or education. But there are times when it’s a good idea to leave something out. Keep the irrelevant information very short and in the background, whilst bringing relevant information to the forefront. A good example of what not to keep is a long list of tasks and descriptions for a previous role that has little or no connection for the new role you are applying for. Past skills that are not going to be of use can also be excluded, but try to keep in mind that there could be some skills that connect to what’s now required. For example, your job as a waiter could be important to a sales role as it shows that you have past experience dealing with customers on the front line. Working in a restaurant means dealing with lots of complaints, so this could also help with a customer service based role as you can show that you have experience in dealing with difficult situations and how you resolved them. A fantastic way to hand pick the right information from your employment history is to look at the soft skills the employer wants. For instance, if communication skills are important to the role, you can now search back through your experience to select examples that show your great communication skills. When writing a CV it’s your goal to show the employer how you’re the right person for the job. It’s not down to the hiring manager to have to figure that out all by themselves from you simply listing your daily tasks. If you’d like to know more about how to get the best out of your work experience section, read our fantastic article – How can my CV demonstrate my previous performance?